Check out the Webmaster's Blog and 2 others, Lisa's Middle Bass Blog and Brian's Middle Bass Blog. Also see the Middle Bass Island Editorials. Kayak Rescue Off Starve Island Yesterday - A kayak with two passengers not wearing life vests overturned near Starve Island yesterday. The passengers were rescued. The initial report said that there had been a fatality, but this was apparently incorrect. - August 5, 2011. Also see a later Toledo Blade story. 2011 Put-in-Bay Road Race Events Start Today and Continue Next Week- June 23, 2011. 2011 Middle Bass Island Open Winners Posted, with Pictures - June 20, 2011. The 2011 Middle Bass Island Arts & Crafts Show will be in the Town Hall on July 23, from 11AM to 6PM - Continuing in the tradition of the arts show that was held at my Aunt Irma's every year, this will be the second year that the show is being held in the Town Hall. The Call for Art is attached. A Wine, Cheese & Jazz reception from 5:00 PM until 6:00 PM will offer Middle Bass Island residents an opportunity to mingle with their local artists. - June 14, 2011. Middle Bass Town Hall News - Attached are the revised bids to show the window replacement committee's recommendation to get bids for both repairing the existing windows and replacing the windows. The Town Hall will be putting a window repair or replacement project and the lawncare up for bid this year. Because we use public funds to pay for projects, we have to put these projects as well as future projects open for bid. Please refer to the attached bids if you are interested because the bid submission deadlines are APRIL 22nd with pre-bid meeting on APRIL 12. The bid notifications will also be posted in the April 2011 PIB Gazette and at the Middle Bass Post Office but we wanted to give you a "heads up" in case you are interested in bidding on the projects. See the Lawn Service RFP or the Window Repair RFP or the Window Replacement RFP. If you have any questions, please contact Marie Rader about the window replacement project: 216-408-8138, marie.rader@gmail.com and/or Teddi Pertner about the lawncare: 614-327-4818, thenov47@yahoo.com. The limited edition Middle Bass Postcard Poster that was available at the artist's fair at Aunt Irma's at the beginning of August, 2004 is still available, by special order only. Lonz of Middle Bass - Reprint/Update of 1982 book. and at a number of other retail locations. Or click on the link to order on the web. Four Other Books in the Middle Bass Web Store - When did you last have the opportunity to buy 3 different books with "Middle Bass" in the original historical title (in addition to the Lonz of Middle Bass book mentioned above)? All 3 are reprints and have great pictures, but none of these has ever been reprinted before. The 4th is a Port Clinton reprint, but with a full-page ad for Wehrle's on Middle Bass that we have touched up and put on the back cover. Three of the books have LOTS of Put-in-Bay pictures. The books are also available at the Lake Erie Islands Historical Society on Put-in-Bay. "Middle Bass, Ohio 1877-1977" Centennial Booklet from 1977. 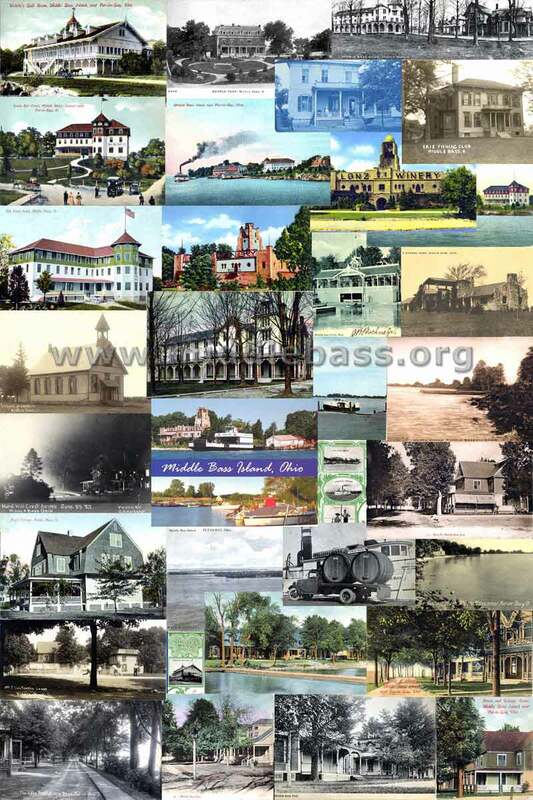 "Lake Erie Islands: Put-in-Bay, Gibraltar, Middle Bass, Kelley's Etc." 1886 picture book. "Nichol's Handy Guide Book to Put-in-Bay, Middle Bass and Kelley's Island", a delightful tourist guide from 1888, newly typeset. "Illustrated Port Clinton and Environs" with sections on Port Clinton, Catawba and Put-in-Bay, and a full page ad for Wehrle's Hall. From 1898. The Middle Bass Island State Park Site can fill you in on the status of the new park. All Contents Copyright © 2000-2010 by Middle Bass on the Web, Inc. All rights reserved.